The food court at the National Zoo in Washington, DC, is a whole lot cooler thanks to the fun sail shade our company recently installed. Installing a sail shade requires a keen eye for measurement, to make sure the posts are placed in exactly the proper locations. In today’s environment, it is a near-necessity to have some sort of playground shade for your outdoor area. 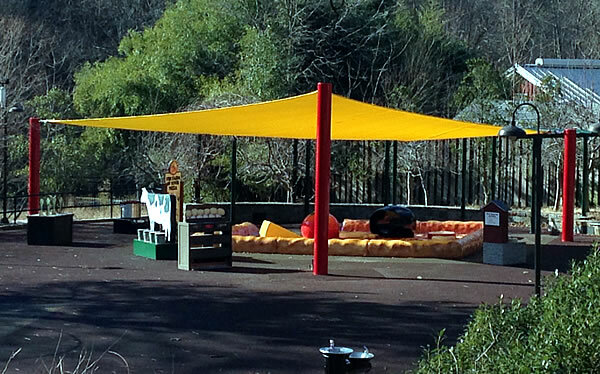 A sail shade is a stylish way to protect the kids in your play area and the equipment out there, especially if you do not have trees to help shade the area. On this page, you’ll find some general instructions for installing playground sail shades. If you have any other questions, just phone us toll-free to talk to one of our experts about how to install them. Step 1: Take measurements of the dimensions of your playground and the area that you would like to cast the shadow over. Be certain to account for the path of the sun and the shadows it casts on your play area throughout the day. An area that’s shaded at 9 a.m. might be in full sunlight by early afternoon! Step 2: Take a look at the options available on our sail shades page and choose the shape and color of the shade you would like. Step 3: Give us a call at (877) 840-0707 so we can give you a little insight into the install process. These sail shades tower over an outdoor commercial playground. Step 1: Break ground to begin the shade structure installation process. Depending on the size of the shade sail you decide to go with, you will need to dig deep enough for a concrete footer for your support posts. Step 2: Pour your concrete, set your posts in place, and brace them once they are in the right place. The proper installation of the sail shade posts will largely determine the integrity of the final structure. Step 3: Once the concrete sets (usually 48 – 72 hours), properly rig your sail canopies on the installed posts. Step 4: Make sure you test the installation for strength at the shade canvas joints and at the posts where the kids may lean or apply additional weight to the structure. There should be little to no movement in the installation under the force of one or two adults. Please note that the instructions are a general overview of the installation process. Every sail shade comes with complete, detailed instructions that should be followed to the letter. Click here to see our square shades and triangle sail shades.